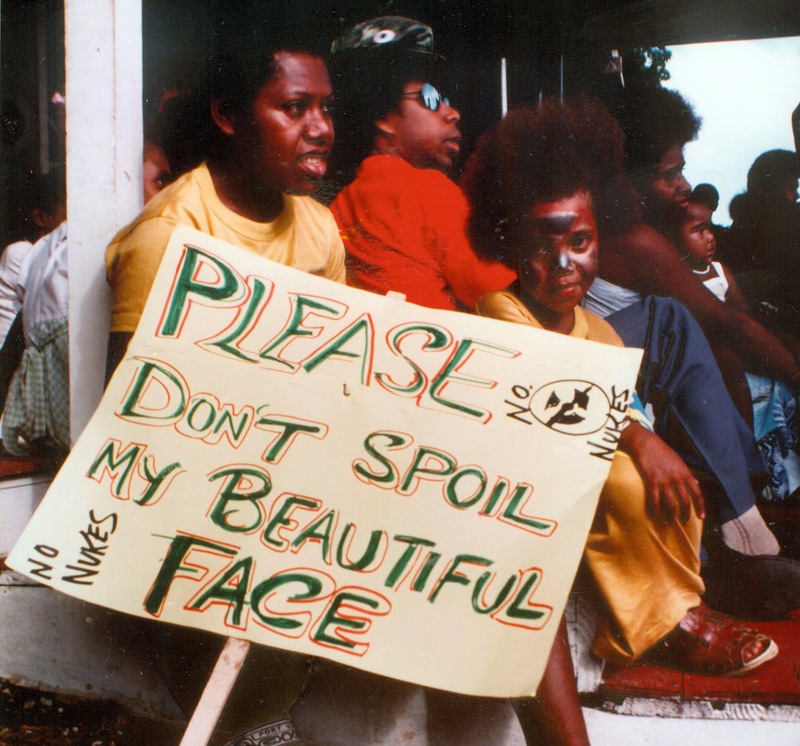 ADVOCATES, campaigners, journalists and researchers gathered at New Zealand's AUT University today to honour past campaigns for the Nuclear-Free and Independent Pacific Movement (NFIP) and to strategise for the future. Panel presentations ranged from the US Castle Bravo nuclear test on Bikini Atoll in 1954 - today, March 1, was the 60th anniversary - to the Rongelap Atoll evacuation by Greenpeace in May 1985, the protests against French nuclear testing, the ICAN campaign to abolish all nuclear weapons, the "forgotten struggle" in West Papua, and to the future self-determination vote in Kanaky. 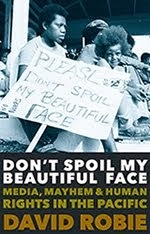 Delegates were also told about a new book being published next month about NFIP issues and journalism - Don't Spoil My Beautiful Face: Media, Mayhem and Human Rights in the Pacific by Pacific Media Centre director and Café Pacific publisher David Robie. 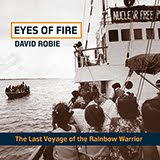 David Robie has been committed to developing quality journalism in the Pacific, and especially in developing a “Pacific brand” of journalism. 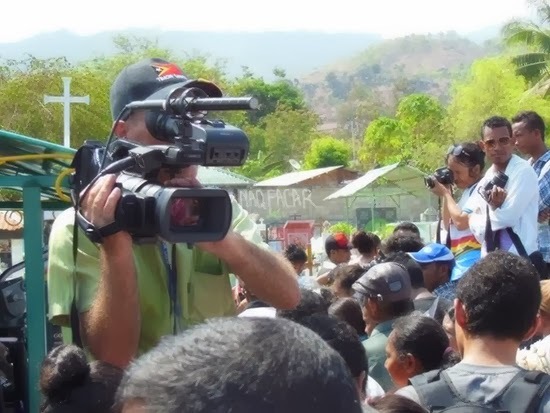 EARLIER this month Café Pacific published two commentaries on the draconian proposed media law for Timor-Leste and why journalists are up in arms about it. They were republished on Pacific Scoop. But it isn't only journalists who are concerned, non-government organisations that often carry out independent investigations on issues that local media don't have the resources to tackle are also upset. It is the narrow definition of "journalists" and freedom of information for the public at stake. One of the provisions essentially gags freelance and independent journalists, and also foreign correspondents are blocked as the draft currently stands. 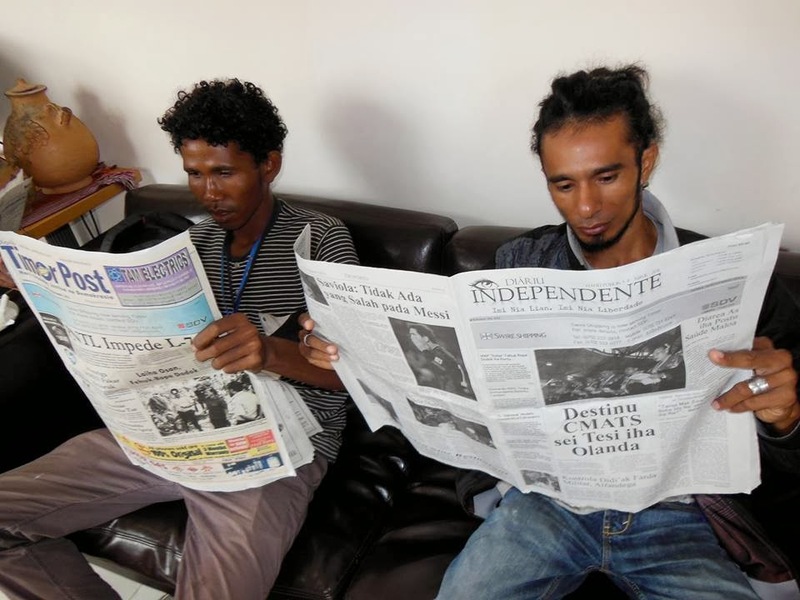 The International Federation of Journalists has issued a statement criticising the draft law and Reporters Sans Frontières is believed to be sending a letter to the Timorese legislators reviewing the draft law. On February 19, Committee A of Timor-Leste's Parliament invited La'o Hamutuk and the HAK Association to present and discuss our views. SO it’s Scapegoat Season again at the University of the South Pacific journalism programme. Barely more than a year has elapsed since the last incumbent was dumped as head. And now Australia-based Dr Ian Weber, a colleague of his predecessor, has shot out the “revolving door”, as Fijileaks put it. He apparently resigned the same week as the journalism classes were supposed to start for the year. His litany of complaints about the USP establishment is much the same as many coordinators have expressed in the past, in private if not always publicly – “favouritism, lack of consultation and unethical pressure” plus general lack of support. So what’s new? 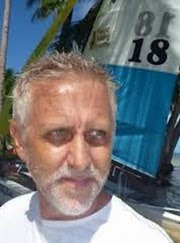 Well, this time Dr Weber has launched into an extraordinary and unfounded personal attack on his distant colleague, a local Fiji Islander who is well on the way to becoming the first Pacific Islands media educator at the regional university with a doctorate in journalism. And Shailendra Singh, a former editor of the Fiji news magazine The Review who has put in far more of the hard yards for the benefit of Fiji and Pacific journalism over the past decade than any expatriate fly-by-nighter, is not even on the Laucala campus in Fiji. The Pacific is a far cry from these situations yet only one Pacific country made it to the top 10 in press freedom for 2014 - New Zealand at ninth. This is not a one off occasion. In 2013, the situation occurred where New Zealand was also the only Pacific country in the top 10. Australia was 28th in the 2014 index. The highest placed Pacific Islands country was Samoa, ranked 40th, closely followed by Papua New Guinea at 44. THE AUSTRALIAN yesterday featured an “historic come-in-from-the-cold” meeting in Suva between Foreign Minister Julie Bishop with Fiji military-backed regime chief Voreqe Bainimarama in a report by Asia-Pacific affairs editor Rowan Callick. 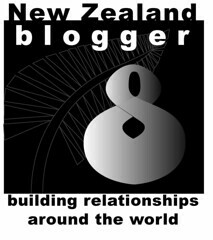 In the Coalition’s most decisive step away from the foreign policy position of the Rudd-Gillard years, it is restoring links with Fiji across the whole of government, including, crucially, defence ties. 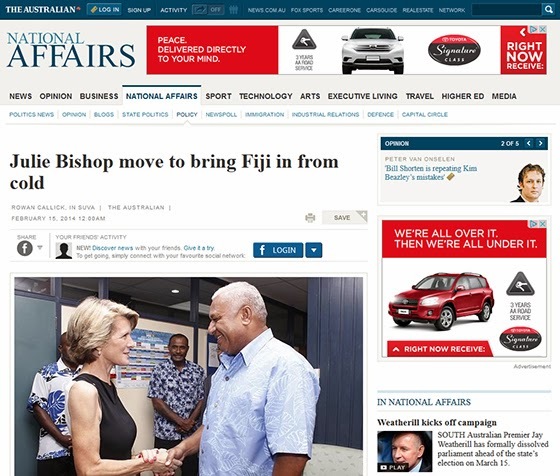 Ms Bishop’s meeting with Commodore Bainimarama went for an hour, running overtime. 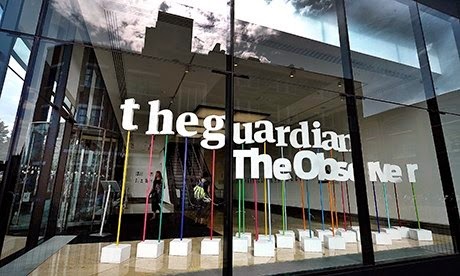 The Guardian offices ... harassed over intelligence leaks. THE UNITED KINGDOM has slipped three places down the World Press Freedom Index rankings this year - to 33rd. According to the global media watchdog Reporters Without Borders (RSF) in its report this week, this was due to the country "distinguishing itself by its harassment of The Guardian" following its publication of the NSA and GCHQ leaks by the whistleblower Edward Snowden. That incident, and the White House administration's reaction to the Snowden affair and the jailing of Chelsea Manning over the Wikileaks revelations, also resulted in the United States falling by 13 places to 46th in the list. RSF remarks: "The hunt for leaks and whistleblowers serves as a warning to those thinking of satisfying a public interest need for information about the imperial prerogatives assumed by the world's leading power." Major declines in media freedom were recorded in Central African Republic and Guatemala but RSF also pointed to marked improvements in Ecuador, Bolivia and South Africa among the total of 180 countries. TIMOR-LESTE Press Club has this week transformed itself into the fledgling Timor-Leste Press Union and now seeks to become affiliated to the Brussels-based International Federation of Journalists. While journalists are worried about the legislation, some are reluctant to openly condemn it. Timor-Leste ranked 77th in the latest 2014 Reporters Without Borders World Press Freedom Index report. 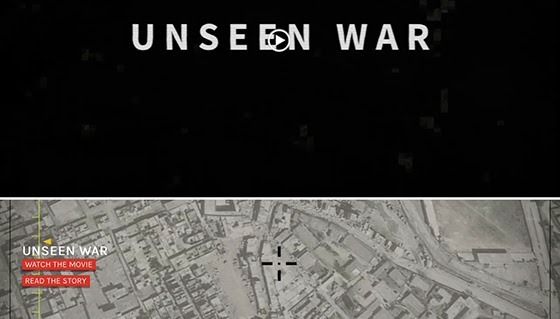 Unseen War ... one of the trilogy of Exposing the Invisible films. IN A remarkable “before we are launched” event organised by the fledgling Sydney Democracy Network in one of Australia’s oldest lecture theatres, a digital technology collective has demonstrated dramatic and progressive examples of the global “information war”. The Berlin-based Tactical Technology Collective co-founders, Stephanie Hanley and Marek Tuszynski, treated a packed theatre at Sydney University to a smorgasbord of video and technology at the forefront of ground-breaking social justice information collaborations. The video Unseen War was an inspiring and provocative investigation into the use of drones for illegal targeting killings in Pakistan’s Tribal Areas bordering Afghanistan – far from the glare of media publicity. An estimated 2500-3500 civilians have been killed in this “unseen war” through drone attacks on urban areas. Twelve journalists have also been killed in the past decade, many as a result of investigating these targeted killings. After being approved by the Council of Ministers last August 6, it has languished in the “don’t touch” basket since then, apart from a critical airing at a conference on the state of the media last October. And then suddenly, with few copies of the document being in circulation previously, a hurried “consultation" was held with journalist representatives this week. A journalists' submission is expected by Parliamentary Committee A by Monday. But other people with a stake in the future of media regulation – such as academics, bloggers, book publishers, non-government organisations, political commentators and media users themselves – haven’t yet had a chance to give any input. While the document contains an interesting attempt to define “duties” of journalists in an evolving new democracy such as Timor-Leste and professes to support freedom of information and the right to be informed, in reality many clauses seek to effectively gag the press and debate. 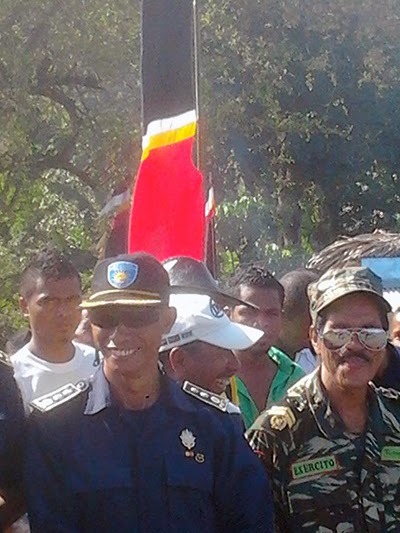 Beatriz's War, East Timor's first feature film. INDONESIAN presidential hopeful ‘Pak” Prabowo, the retired Kopassus general notorious for his alleged human rights violations in Timor-Leste, has finally broken his silence and made a statement to the Jakarta Post denouncing a recent article about his past as “scurrilous allegations”. Yet his odious record speaks for itself. He claims in an open letter that allegations about his actions three decades ago, notably the massacre in August 1983 in Kraras - now known as the “village of widows", were "based on unproven allegations, innuendos and third-hand reports". to the Kraras massacre victims in 2013. He was referring to the massacre that has been immortalised in Beatriz's War, the harrowing new film about the Timorese struggle for independence from Indonesia, especially telling the story from a woman's perspective. Heroine Beatriz (a composite character created from real life people) was a survivor from the Kraras massacre. Prabowo is depicted as being responsible for many human rights atrocities in the film. Santoso recently described Prabowo as one of the “most interesting – and most controversial” presidential hopefuls in the Indonesian elections due in July because he has reinvented himself as an anti-corruption campaigner. 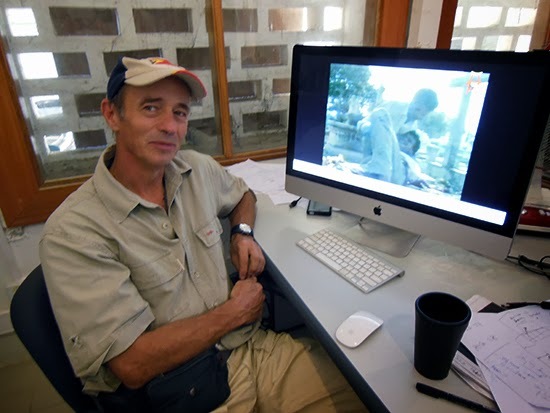 In a documentary made a decade later by Yorkshire Television’s Peter Gordon, Bloodshot: The Dreams and Nightmares of East Timor, that interviewed key players –including Stahl himself - in the transition to restored independence in 2002, Timorese leaders reveal just how critical this footage was in telling their story of repression to the world.